← Andy Reynolds Best Selling Author An Amazon Best Seller! 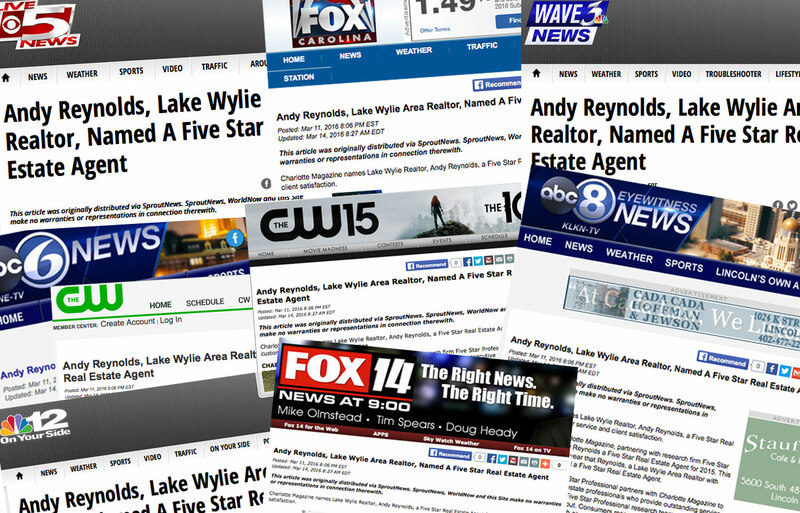 Charlotte Magazine names Lake Wylie Realtor, Andy Reynolds, a Five Star Real Estate Agent for customer service and client satisfaction. CHARLOTTE, NC – Charlotte Magazine, partnering with research firm Five Star Professional, named Andy Reynolds a Five Star Real Estate Agent for 2015. This is the second consecutive year that Reynolds, a Lake Wylie Area Realtor with Keller Williams, was named a Five Star Real Estate Agent. In an annual process, Five Star Professional partners with Charlotte Magazine to identify Charlotte area real estate professionals who provide outstanding service and client satisfaction. The Five Star Professional research team contacted thousands of recent homebuyers and other consumers in the area for input. Consumers responded to the survey by phone, mail and online. They rated real estate professionals on criteria, such as overall satisfaction and whether the consumers would recommend the professional to a friend. Five Star Professional named the following objective criteria for being named a 2015 Charlotte Five Star Real Estate Agent: received a qualifying client satisfaction rating; satisfied the applicable state licensing requirements; actively employed as a licensed professionals for a minimum of three years; a favorable regulatory and complaint history; satisfied minimum client volume on a one-­‐year and three-­‐year basis. No more than seven percent of all real estate professionals were named as award winners. Andy Reynolds is the Top-­‐Ranked Keller Williams Agent for individual production in the greater Lake Wylie area as well as in the Top 1% of all Keller Williams agents in both Carolinas. He has lived his entire life at the lake, which has given him local knowledge that is difficult to duplicate. Reynolds is a licensed broker in both North Carolina and South Carolina. He has won numerous awards as a leading agent with Keller Williams Realty International, the largest real estate company in the world. Reynolds is a contributing author of the Number 1 Amazon Bestselling Book, The Essential Guide To Charlotte Real Estate, in which he wrote the chapter on buying and selling homes in the Lake Wylie area.